Stonehouse Court is a 17th-century manor house hotel situated in a peaceful location overlooking Stroud Water Canal. This charming venue also boasts glorious views of the Stroud Valley. Just 30 miles from Cheltenham and 10 miles from Gloucester, the 36-bedroom hotel is set within six acres of grounds, with a choice of newly refurbished deluxe Manor House rooms or smaller, snug Garden Rooms, housed inside the Stonehouse Court’s newer extension. Elegant yet traditional, the rooms have been designed to include free Wi-Fi, smart televisions and luxurious bathrooms, whilst maintaining the hotel’s period features. The hotel’s Court Brasserie is a hidden gem for foodies, inviting both guests and non-residents to dine in impressive surrounds; merging the classic charm of a 17th century manor with modern British dishes selected by head chef, Graham Hilton. The seasonal lunch and evening menu features local ingredients where possible to create tempting dishes such as slow cooked belly of pork with balsamic glazed shallots, creamed carrots and crispy potatoes; and grilled red mullet with aubergine puree, roasted cherry tomatoes and a chilli and garlic dressing. The eclectic menu also includes a range of smaller tapas style dishes, including honey-fried prawns and garlic pitta; as well as more traditional dishes such as beer battered fish and chips, bangers and mash, and steak and ale pie. Stonehouse Court also has a beautifully landscaped outdoor garden and terrace, making it ideal for alfresco dining. The hotel also serves afternoon tea every day from 12pm to 5pm, with a choice of cream tea and fully tiered selection of sandwiches, scones and cakes. Guests can also add a glass of champagne for the ultimate special occasion. Following a substantial refurbishment, Stonehouse Court now boasts a new cocktail bar, known as Bar 1601. Offering decadent drinks in its glamourous, contemporary setting, Bar 1601 is a destination in its own right, and a must-try bonus for guests staying on site. For more information, call (01453) 794950, email info@stonehousecourt.co.uk or visit stonehousecourt.co.uk directly. The brasserie at Stonehouse Court offers a relaxed dining setting for guests and visitors alike, with SoGlos's deputy editor brightening up her Monday with a trip to the 17th century manor house hotel to try out its menu. The Brasserie at Stonehouse Court Hotel is open to guests and non-residents alike. Stonehouse Court's refurbished brasserie offers a relaxed setting for guests and non-residents alike to enjoy dining in the restaurant of the 17th century manor house hotel. The menu focuses on serving up informal modern British cuisine, using local, seasonal ingredients where possible in its dishes. While the starters tempted us, we decided to opt for a selection of the menu’s small plates to whet our appetites, choosing the mini mozzarella and tomato stack; the halloumi with chilli dip; and some rustic bread with balsamic. The small plates are ideal if you want to enjoy nibbles with a pre-dinner drink, and were just perfect for sharing between the two of us, firmly making a dent in our hunger! With plenty of tempting choices, we eventually settled on the curry scented cod fillet served with parmentier potatoes, baby spinach and seasonal vegetables. The fish was perfectly cooked, and the cream sauce a welcome accompaniment, but I would’ve liked the curry flavours to have come through a bit more in the dish. We also sampled the roast chicken breast with gnocchi, wild mushrooms and cream sauce, which was really tasty and flavoursome. It was served with a medley of vegetables which offset the richness of the dish just right. 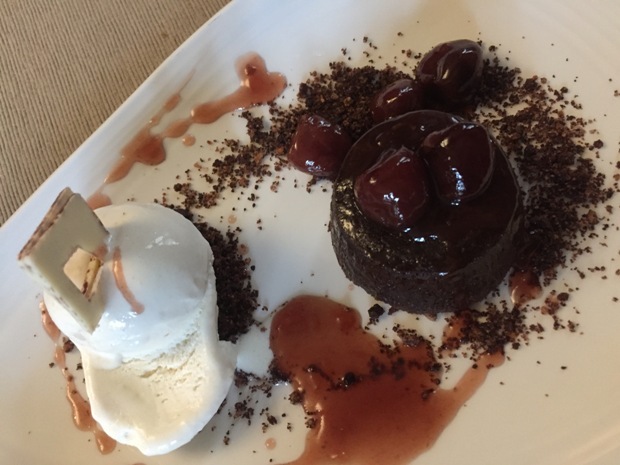 While dessert isn’t a normal Monday occurrence at home, we couldn’t pass up on the chance to share the chocolate fondant with malt ice-cream and hot cherry sauce. It could’ve been a touch gooier for our liking, but it was still delicious and was the perfect sweet treat to finish our meal with. The hotel also offers a delightful outside space with views of its picturesque gardens where you can enjoy drinking and dining during the summer months. Sadly we didn’t get the chance to enjoy it on this occasion, but that just means we have an excuse to return! If you fancy afternoon tea instead, the hotel also serves up delicious teatime treats which can be enjoyed in the gardens or in the cosy lounge area next to the open fire. For more information see Stonehouse Court Hotel, call (01453) 794950, email info@stonehousecourt.co.uk or visit stonehousecourt.co.uk directly. The Prince of Wales Hotel in Berkeley has a choice of 43 modern rooms, as well as a bar and restaurant.